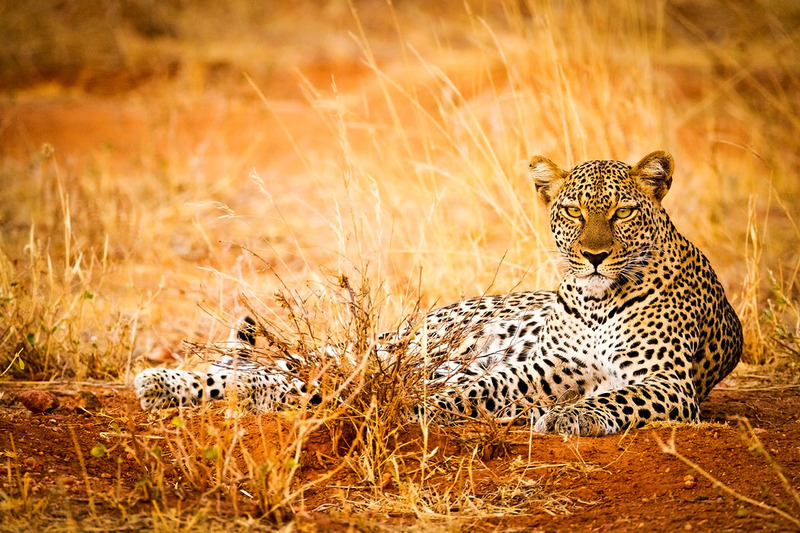 This beautiful young leopard was photographed in Samburu, Kenya, Africa, as he watched grazing Impala in the distance. The iron rich soil and golden grasses of the central desert region of Kenya act as the perfect camouflage for this beautiful, but lethal predator. The African Leopard (Panthera pardus pardus) is an elusive, agile and stealthy predator. Mostly nocturnal, this smaller member of the Panthera genus is able to take on large prey successfully, mainly due to a massive skull that allows for very powerful jaw muscles. Powerful swimmers and runners, able to reach speeds of 35mph and leap over 20 feet, these magnificent cats are also known for their climbing abilities. It is not uncommon to observe a leopard resting over the carcass of its prey...perched high on a tree branch.